Chicago’s political history sometimes reads more like a House of Cards script than it does a civics lesson. Terms like “Chicago-style” politics and “the machine” have become ubiquitous nationwide to evoke corruption, quid pro quo arrangements, and nepotism. Of course “the machine” is not actually a machine—it is a shorthand for the relationships and strictly enforced loyalties that allowed the Democratic party to consolidate power in Chicago over the course of the twentieth century. While the machine enjoyed its heyday under the father-son duo of Mayors Richard J. and Richard M. Daley, many of today’s elected officials remain beholden to this power structure or employ its tactics: rewarding supporters with contracts and city jobs, intimidating dissenters, and backing legislation which will line their own pockets. 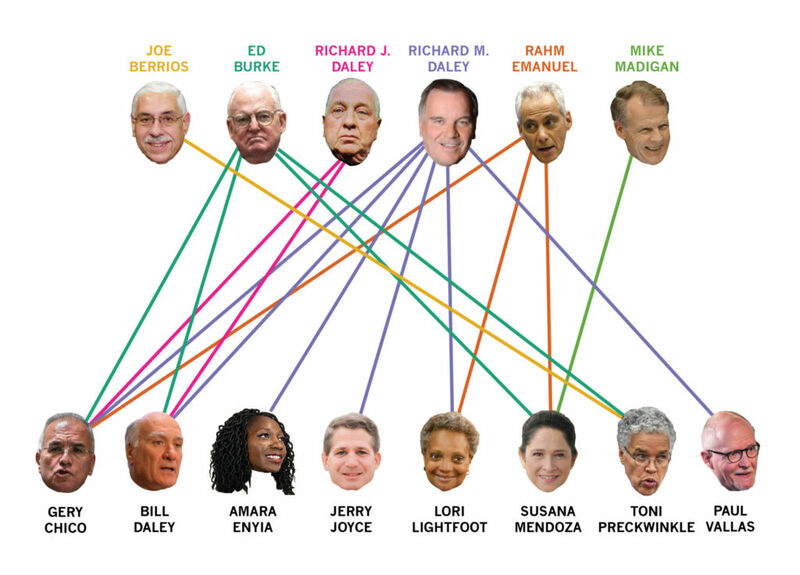 To help voters prepare for February’s municipal elections we’ve assembled a map of mayoral candidates who are implicated in Chicago’s machine, through their relationships with the Democratic party’s head honchos. He’s the longest-serving House Speaker of any state legislature in the country, but that lofty distinction doesn’t even begin to adequately describe the reaches of Mike Madigan’s influence. He has garnered a wide reputation as a hard-nosed partisan whose shrewd maneuvers and bottomless financial warchests allow him to wield influence in just about every election or legislative battle in Illinois. He is the president of the Illinois Democratic Party, he goes way back with the Daleys, and has poured campaign funds into the pockets of Alderman Ed Burke. One of his more “notable” legacies? The gerrymandered electoral map that now governs the state, all but guaranteeing Madigan’s re-election into perpetuity unless newly elected Governor Pritzker makes good on his pledge to establish an independent redistricting commission after the 2020 census. The Chicago Tribune once referred to Joe Berrios as the “classic somebody somebody sent.” As assessor, he was investigated by the county Board of Ethics for hiring close friends and family members to senior positions in his department. Berrios is responsible for creating a discriminatory property tax system that overvalued properties owned by minority and low-income residents and undervalued properties owned by their white, wealthy counterparts. In other words, the system gave tax cuts to the rich and put a tax burden on the working class. Berrios also accepted eye-popping financial contributions from the tax appeal lawyers who make a living by helping clients take advantage of that same system. Illinois voters had enough and voted him out of office in March 2018 during the Democratic primary, but he leaves behind a network of appointees, protégés, and business people who all share a vested interest in the status quo. The elder Daley was the city’s longest-serving mayor. He didn’t invent machine politics but he may have perfected the art, building an efficient political organization through patronage—trading government jobs and services for votes and campaign cash. Although he died in 1976, Daley Sr. left behind a strong culture of pay-to-play that lives on. As the son of the original bossman, Daley Jr. was bound to follow in his father’s footsteps. During his tenure as mayor, Richard M. Daley surrounded himself with a small circle of fierce supporters whose political future was entangled with his own, bartered with administration jobs, and cemented unwavering support from deep-pocketed developers by exchanging splashy downtown projects for campaign contributions. Burke more or less inherited his place at the helm of the 14th Ward from his father Joe Burke and is the only sitting alderman who was around during the tenure of Daley number one. He remained an ally to the family throughout both Daley administrations, and was among the coalition of white aldermen who organized to strip power from Chicago’s first Black mayor, Harold Washington, during the “Council Wars” in 1983. As a tax appeal lawyer, he’s benefitted from the county’s unfair property tax system (overseen most recently by Joe Berrios) and has stirred controversy in recent years by helping the Trump Tower get out of paying $14 million in taxes. His side hustle has resulted in numerous conflicts of interest; the Better Government Association recently reported that Burke has had to recuse himself from City Council votes 464 times in the last eight years—more than all other aldermen combined. The FBI just booked Burke on federal extortion charges for allegedly shaking down a Burger King franchise. ED BURKE: The disgraced alderman has been pay-rolling Preckwinkle’s political pursuits since she became 4th Ward alderman in 1991. That includes a fundraiser at Burke’s home last year that raked in $116,000, some of which allegedly came from Burke’s Burger King shakedown. Preckwinkle vows to return this money and has attempted to downplay her tenured relationship with Burke. Still, she hired his son for a county job that paid nearly $100,000 in December 2014, even with a pending internal investigation into his alleged sexual misconduct at the Sheriff’s office hanging over his head. JOE BERRIOS: Sure, he oversaw a property tax system that disproportionately targeted lower-income minority homeowners, while giving downtown office buildings a break. But even after a damning series of investigations into Berrios’ office by ProPublica and The Tribune, Preckwinkle stood behind Berrios and endorsed him for his failed re-election bid in March. RAHM: Mendoza has had a close relationship with Emanuel since her time as City Clerk; she served as co-chair on Rahm’s re-election campaign in 2015. Ink hadn’t dried on the November ballots that elected her comptroller before Mendoza was reportedly reaching out to Emanuel strongholds for mayoral campaign cash. ED BURKE: Even if you put aside the thousands of dollars Burke and his cronies have raised or donated to Mendoza’s campaigns, there’s still a years-long personal connection. Most notable? Perhaps the fact that she and her husband were married in Burke’s home by the alderman’s wife, who is a state supreme court judge and Mendoza’s longtime mentor. MIKE MADIGAN: She’s a self-proclaimed Madigan “protégé,” and since her entrance into public office, Mendoza has received hundreds of thousands of dollars whether from the powerful house speaker or from one of the many PACs he uses to fund favorable campaigns. RICHARDS M. AND J. DALEY: Bill Daley is… a Daley! He is the son of Boss Daley, Chicago’s longest-serving mayor who perfected machine politics, and the younger brother of Richard M. Daley, our second Daley mayor. Bill has taken some steps to distance himself from his brother, criticising the fumbled parking meter deal and mishandled pensions. ED BURKE: The Daley and Burke families go back generations, each having made financial contributions and pledges of fealty to the other many times. But in October, before the FBI’s investigation of Burke came to light, Daley publicly called for Burke’s retirement, hinting at some love lost. RICHARD M. DALEY: Chico served as Daley Jr.’s chief of staff for three years before the then-mayor appointed him as president of the Board of Trustees of the Chicago Public Schools, a position which he held for six years. RAHM: After losing to Emanuel in the 2011 mayoral race, Chico endorsed the incumbent mayor wholeheartedly in 2015. ED BURKE: Burke’s been around so long that he sat on the City Council Finance Committee when Chico had just entered public life as an aide. Chico served as chief of policy for Burke’s Committee during the “Council Wars.” The two have had a close personal relationship since, and Burke endorsed Chico in the race for mayor. Like everyone else, Chico is now trying to distance himself from the alderman. After the FBI bust he announced he would no longer accept Burke’s support. RICHARD M. DALEY: Some argue that Enyia got her political start when the outgoing mayor hired her as a policy analyst in 2009. RAHM: Emanuel appointed Lightfoot as head of the Chicago Police Board twice before naming her co-chair of a police reform panel after the Laquan McDonald shooting. Though her ties to Emanuel complicate her fiercely anti-establishment platform, she has been critical of the mayor—especially his record on police reform—since launching her run. RICHARD M. DALEY: Lightfoot held multiple positions within the Daley Jr. administration. Most notably, Daley tapped Lightfoot to lead CPD’s Office of Professional Standards—which reviewed cases of police misconduct and recommended disciplinary action. This office was later reformed after public scrutiny—including a Tribune investigation—led to questions about its effectiveness and its lenient treatment of officers. RICHARD M. DALEY: Daley first appointed Vallas as budget director of the Illinois State Legislature. Later, Daley created a new role—CEO of CPS—and appointed Vallas to the post, where he served for six years. Vallas received national recognition for his success in balancing the budget and creating summer school and after-school programs; locally, however, he received pushback for expanding charter schools in the district and for his school reconstitution policies, which involved firing or reassigning a school’s entire staff and starting from scratch. Carly Graf is a contributing editor to the Weekly. Most recently, she contributed to the Holiday Gift Guide. Doesn’t Chuy Garcia and Team Chuy qualify as a New Chicago Machine? Tactics are similar to Old Chicago Style Politics and Chicago Way. The method by which Garcia was chosen Congressman is unusual and machine style. “Musical chairs” is one way of describing how former Congressman Luis Gutierrez chose to delay his retirement announcement until it was so late in the election cycle that it gave few the opportunity to run and used the retirement press conference to announce he was “recommending”/”anointing” Chuy Garcia as his choice for successor. Although Garcia was democratically elected, other candidates like Sol Flores, were at a disadvantage and it is a strange coincidence that former Congressman Gutierrez’ daughter, Jessica Gutierrez, was later endorsed by Garcia for 30th Ward alderman. 2. “Double standard on empowering more QUALIFIED Latina women to under represented political positions”. Although Garcia selected Alma Anaya, his former administrative assistant to succeed him as County Commissioner, his decision to support other Latina candidates is questionable. In his home ward, (22nd) he had the opportunity to support Fanny Diego Alvarez, a dedicated 22nd ward IPO supporter who wanted his endorsement, yet he chose to endorse Michael Rodriguez, the current 22nd IPO president instead. Ms. Diego-Alvarez, according to a Chicago Tribune article from June 25th, 2018 by Jacqueline Serrato, has been a loyal Chuy supporter and political activist for over 10 years in the 22nd ward IPO and was well qualified for the position. Yet, Garcia decided to pass on this Latina candidate. In the 25th Ward, Garcia has chosen to endorse Hilario Dominguez, a volunteer on his 2017 Democratic primary Team Chuy campaign over Aida Flores, a Latina, raised in Pilsen, experienced educator, and a highly qualified candidate. Garcia has given very little justification for going with the male candidate Dominguez over Flores, other than the fact that Dominguez was a campaign worker of Garcia and comes from the TEAM CHUY political organization. Interestingly, enough in the 14th ward, Garcia chose to endorse Tanya Patino, another campaign worker from TEAM CHUY but here the rationale for Garcia’s endorsement was according to the Chicago Sun-Times, “Garcia chooses a horse in 14th Ward race against Burke” and in Garcia’s own words, “With her professional development, she is highly qualified to be a player in the City Council to increase the number of women, given the under-representation.” So the line in this ward is that Latina candidates need to be prioritized especially, highly qualified Latinas. What about the two Latina women in the 22nd ward and in the 25th ward, both areas where Garcia represents, are they not a priority? The public will determine how highly qualifed for public office Tanya Patino is which is questionable for a 28 year-old People’s Gas employee, but what is very clear is that she also worked on TEAM CHUY and that she is related, the girlfriend of State Representative Aaron Ortiz. One has to wonder would Patino be the chosen Garcia candidate if this was not case? Also adding evidence to Garcia’s double standard on the need for qualified Latinas to fill under-represented political positions is the fact that his Latino Leadership Council, a PAC championed by Garcia and former Congressman Gutierrez is intended to bring more parity and empowerment for Latinos, also severely lacks women members. The Latino Leadership Council LLC is overwhelmingly male. Women voices in this organization that seeks equity and influence, are seen as a priority. Lastly, the response by Congressman Garcia to two recent “Me Too” situations relating to his leadership circle is questionable at best. According to the Chicago Tribune, “U.S. Rep Garcia’s chief of staff out amid allegations over handling of earlier sexual harassment claim”One day into his job as Congressman, Garcia remained silent on how to react to the awful sexist behavio by the person he chose to lead his Washington D.C. office. Although, Garcia can’t be blamed for the harassment incident, he does have a obligation to make a public statement about it and the only direct comment made by Garcia about it was, “it became a distraction”. More is expected from Garcia or any other public official. To stay silent on the topic and then address it as a distraction speaks volumes about the severity and priority of this situation. Similarly, Garcia had little to say about his protege, 22nd ward Alderman Ricardo Munoz domestic violence arrest on January 3, 2019. Protests by others in the ward reached a height and forced Garcia to finally come out publicly a week a later on Thursday January 10th, after it looked like “Me too” situation might affect Garcia’s candidate. Garcia’s comments on the issue are questionable as he said to the Sun-Times, “He should resign. Its best for him and for all the attention it is getting.” The attention that minimized Garcia’s chances of retaining the 22nd ward. 3. Congressman Garcia strong arms Jose Torres to drop out of 14th ward race. According to both Chicago Sun-Times, Chicago Tribune, and Torrez own words, “Congressman Garcia persuaded him to drop out in favor of Patino.” What is interesting is that Patino signed Torrez’ petitions and indicates that at some point she believed Jose Torrez made a good choice for Alderman in the 14th ward. The level of conversation between Garcia and Torrez had to have been extremely convincing to take a candidate like Torrez, who claims to have 100 plus volunteers and $20,000 in his coffers to fold up shop and support Garcia’s choice. And although we should give people the benefit of the doubt, it will be interesting to see where Torrez lands in the near future and if Congressman Garcia has any influence in his career path. 4. Arrangements between with Party Boss Madigan and Congressman Garcia. There are absolutely no Latino candidates running for Alderman in the 13th ward, home to Speaker Michael Madigan. That is rare, since the Latino community has a heavy presence and growing. It is also a coincidence that Speaker Madigan heavily supported Alma Anaya for Cook County Commissioner in the 7th District to succeed Garcia. Congressman Garcia has fielded candidates in 25th, 22nd, 12th, 14th, and 15th wards all of which form part of his Congressional district. How strange that the Speaker backs Garcia’s candidates and Garcia does not recruit Latinos to run in13th Ward which is in Madigan’s back yard. Answer: Boss to Boss understanding. All of these situations confirm a New political Chuy Machine, with Chuy Garcia as the undisputed Boss. The consequence is a growing political influence that is going unchecked. I think the mayor’s race is a joke! I’m not going to single out one person but everybody’s basically saying the same thing. if you listen to keywords of what they are saying is basically bull. if you really want to get down to the root of the problem you do not start with kids the root of the problem is the home environment. when you live in a stressful environment and your parents I’m not living up to their expectations the kids does not have a chance because when you wake up in the morning you’re frustrated when you go home after school you frustrated this is where the streets come into play because it look for alternative love and he should be getting it at home. If you make sure the whole family is succeeding the child will succeed because it starts with the mother and the father make sure you get them on their feet and you will see progress with the kids.I will debate anybody on this because it’s a proven fact. I agree with you 100%. But what can pols say? They can’t tell the truth or they will be accused of putting down poor people or people of color. And what can pols or society in general do? Can they go into these homes with the stressful environment and take the kids away from the parent(s)? I don’t think so. Plus it would cost money to do something like that. Money we don’t have.